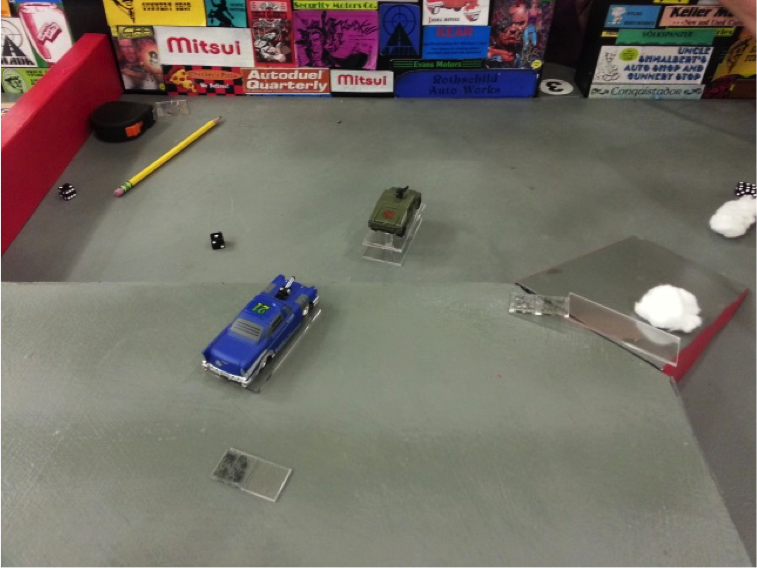 Daily Illuminator: Car Wars At Dragonflight 39! 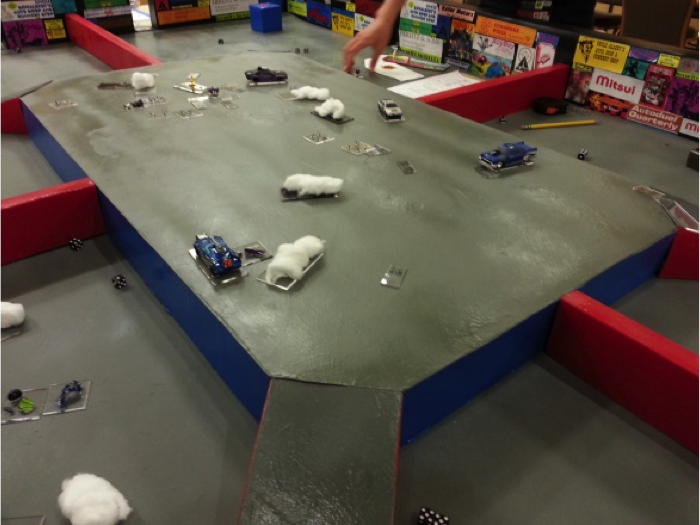 October 2, 2018: Car Wars At Dragonflight 39! This count doesn't include the numerous players who stopped to watch, check out the Autoduel America map, or cheer on the combatants. At 7 p.m., the top finishers (or alternates, in a couple of cases) from each qualifier assembled for the final round. 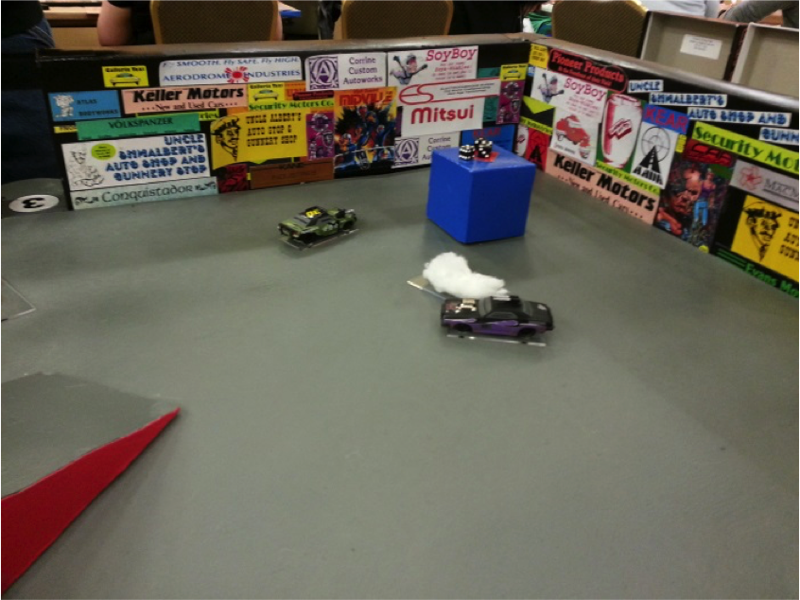 This battle has a longer time period and the competitors each had a different vehicle design (their cars are detailed below). After selecting their vehicles and receiving their gate assignments, they were ready. First blood went to Andy in Car 30, as an HMG tags Tina's car 23. She returns fire with a flamethrower hit. Archie in 63 tries for a hard shot, missing the tire of Molly's car 21. Paul hits the number 28 car driven by Chris (who is hitting the ramp) for the first debris of the match. The damage was not appreciated – a flamethrower blast is returned. Molly T-bones the side of number 63 for the first literal run-in for minor damage. This is quickly followed with rocket launchers. Unfortunately, this costs her half her speed, forcing her to circle around to build up speed again. 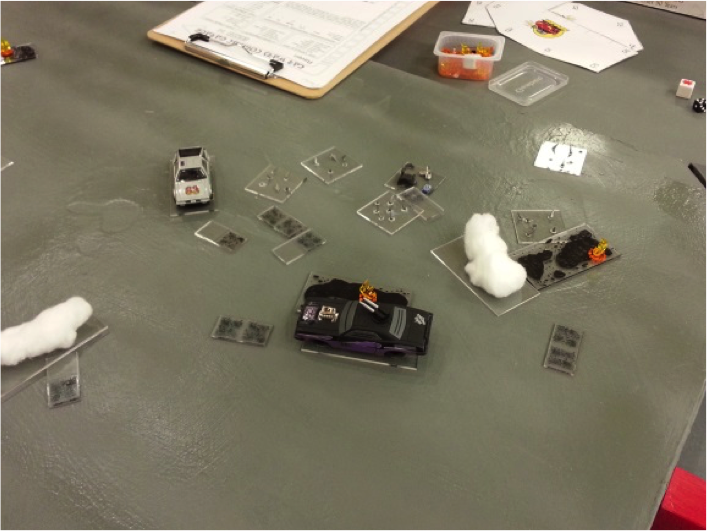 Car 28 abandons the ramp and pulls a hard turn to face down 35, with both exchanging fire, including some paint clouds being left behind. The two-time defending champion, Christopher (car 42), appears to have struck a truce with Daniel in car 38, as both head to the upper deck without exchanging fire. Archie's car 63 leaves incendiary spikes for Molly . . . whose car manages to drive right over them, unscathed. Cars 35 and 28 endure a high-speed sideswipe, with 28 receiving a bright pink paint job along the way, impeding its fire for a few seconds. Andy's car 30 ignites from Tina's flamethrower hits – fire! Fire extinguisher fails. Andy is handed the much-feared "Boom" die, with its five blank faces and a single explosion side (used to roll the 1-in-6 chance that a flaming car with volatile weapons has of exploding). As chants of "BOOM, BOOM, BOOM" echo around the table, Andy rolls . . . followed by a bunch of "awwws." Car 35 starts heading up the ramp and also ignites from car 28's earlier strikes. Paul discovers a serious design flaw – he selected no fire extinguishers! Cars 23, 38, 42, and 63 have reached the upper deck. Andy swings around the corner bunker for a parting shot on Tina, who returns fire with her flamethrower. Both hit; more debris. Archie opts to put his spikes on automatic fire. Christopher tags him with his Vulcan, then tries to squeeze between the spikes. At the far corner of the arena, Andy's fire trouble continues. His fire extinguisher fails again. As chants of "boom, boom, boom," again echo around the table, Andy rolls . . . followed by a cheer heard around the hall. His choice of a gas-powered engine becomes questionable as his vehicle explodes! Tina notches up the first kill of the match. Christopher triggers some of the incendiary spikes and puts another Vulcan into the back of Archie's car, sending him into a spinout. Not a good situation with double spike droppers on automatic. Daniel T-bones Tina. Oil on the upper deck ignites, adding to the fire dangers. 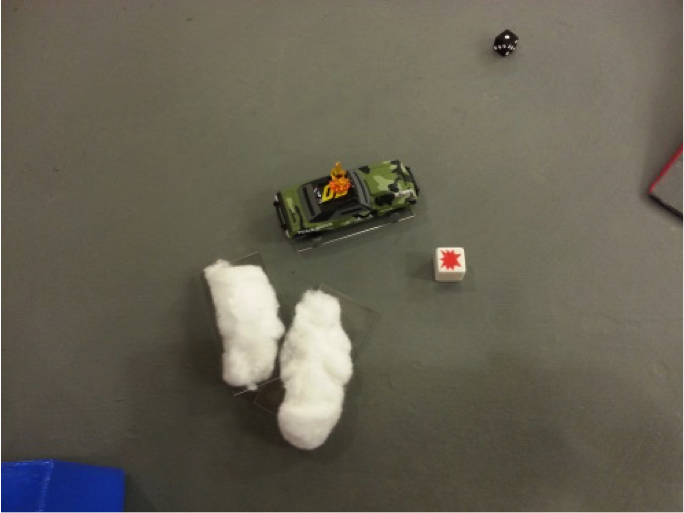 They exchange fire again, with hits for both vehicles. 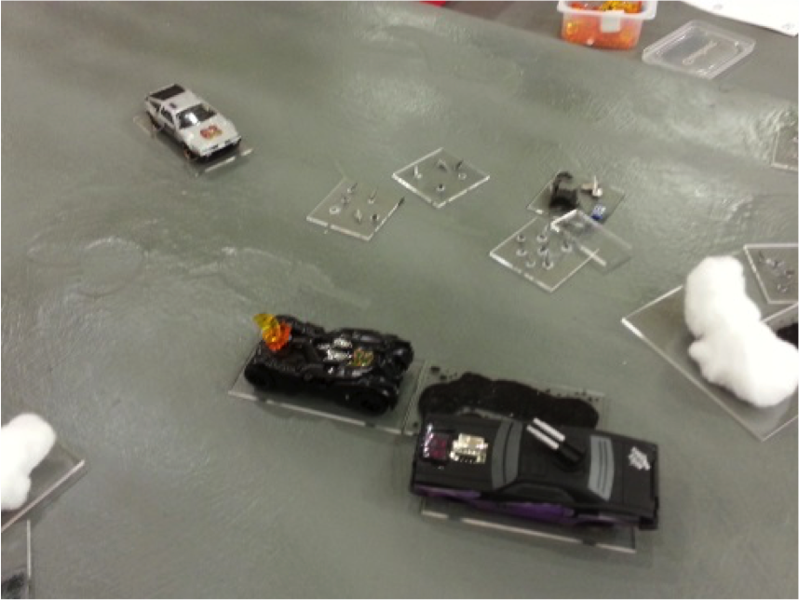 Archie manages to disengage his spike droppers, but his car continues spinning . . . right toward the edge. He stops, with one tire hanging off the edge, and facing back toward the main fight. The still-burning car 35 and car 28 have been exchanging fire in their corner when car 42 jumps from the upper deck to enter their private fight. He triggers an FCE . . . right before slamming into a head-on collision with car 28. The two Chrisses take 41 points of damage to their fronts and, to add insult to injury, Christopher is shoved backward into his own flame cloud, for 5 points of damage to every location. Cars 23 and 38 collide on the upper deck. Arena management sends out a reminder to spectators not to litter – the cleanup crew is going to have enough trouble with the mess of items dropped on the upper deck. A combination of the incendiary spikes and the flamethrower strikes on Daniel's car ignites the vehicle. Hopeful chants of "boom, boom, boom" again turn to disappointment. Damage to car 35 continues. 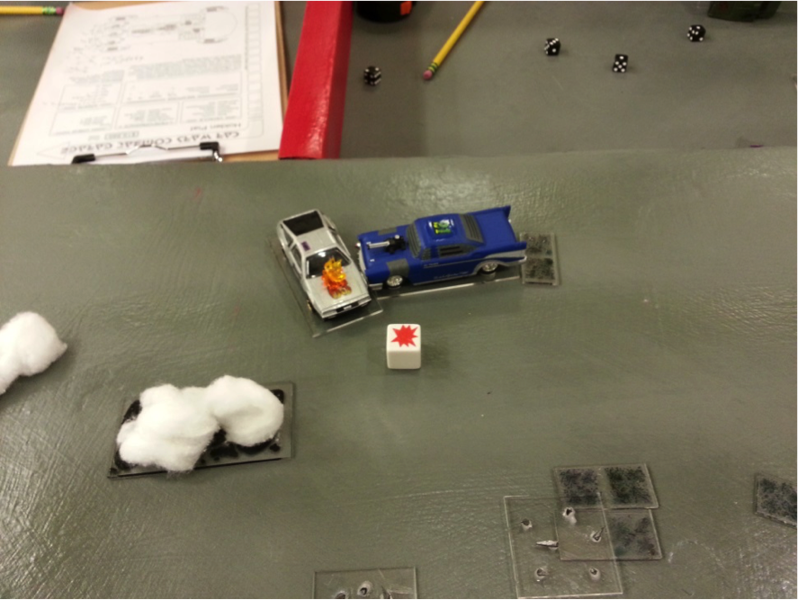 His weaponry finally gone and component armor burned through, Paul opts to flee the arena to deny a kill to car 28. The pit crew manages to extinguish the fire. 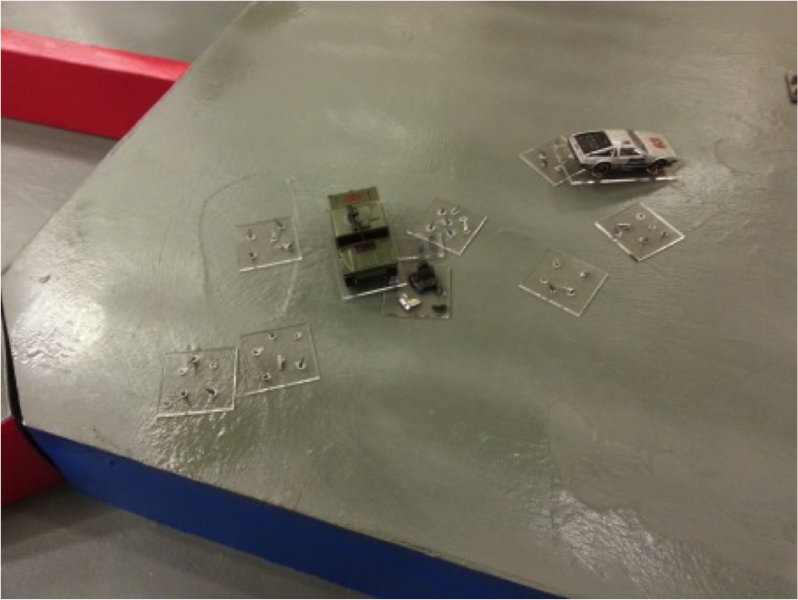 Car 63 has his right armor breached, with the incendiary spike droppers hit – more chances of fire. He swings about to approach 23 and 38. He dumps rockets into the side of 23 – a breach, with a small amount of damage hitting the driver. The oils she is sitting atop makes the hazard significant. Tina's return flamethrower shot misses. Daniel's car 38 has to roll the dreaded die again. The chanting this time appears to work – another explosion! His flaming oil jet goes up, reducing another vehicle to pieces. This kill is split between Tina and Archie, giving the match clear leaders, though they are also damaged by the explosion. Car 63 tries for a ram on 23 . . . but comes up a tad short. Archie settles for firing his triple rocket launchers into the breached side of Tina's car. Three hits – all to the driver. With an excess of 30 points of damage, Tina is taken out of the match, letting Archie take the lead. Cars 42 and 28 continue to exchange fire, with 42 heading up the ramp to protect his breached front armor. Molly, in car 21, has finally rejoined the match, moving to the upper deck not far from 23 and 63, who continue to exchange fire. 23 stops . . . on top of flaming oil. Not a good place to park. Car 21 unloads rocket launchers into 63, giving him a breach on his left side to match his right side; power plant damage. Molly's spike luck runs out – she triggers some of the incendiaries this time. Multiple cars ignite, but the extinguishers are finally suppressing the fires. Cars 63 and 21 both swing about, trying to catch Christopher's car 42. Weapons fire is exchanged: 63 loses his engine to a Vulcan hit from car 42. 21 continues following 42, hitting him again in the back . . . a breach, flame cloud ejector destroyed, and the driver's flak jacket soaking up the remainder. Car 28 is still In the match: Chris takes his vehicle up the ramp, to join the fray on the upper deck. Car 42 jumps off the upper deck. Molly's car 21, still pouring on the speed, pursues him, hitting with a pair of rocket launchers. To make it even worse, 42 rolls upon landing. This ends Christopher's bid to become a three-time champion, while giving Molly a kill. Hurtling toward the edge, Molly slams on the brakes, dropping her speed to a scant 5 mph. Archie's car 63, still coasting and concerned about his loss of power plant and fire extinguisher, unloads on Molly with his triple recoilless rifles before finally stopping. His weapons remain trained on car 21. Chris, in car 28, driving along the edge of the upper deck, snipes 63, tagging him with a flamethrower. Molly spins her car about in a pivot, unloading with her rocket launchers on car 28, doing enough damage to penetrate the armor and knock the driver unconscious. This gives her a second kill. His car continues coasting forward, leaving Archie and Molly to face off. Archie continues pummeling Molly's car with his RRs. She returns fire, inching her car forward. She manages a hit through the driver, but component armor continues to protect him. Archie unloads the rifles repeatedly into her front armor. Molly manages a low-speed collision to Archie's side – more damage, but still not enough to take down the driver. However, the collision shifts Archie's car, removing the threat of his rifles. Molly is looking for her third kill . . . But fate and fire strike again. The lingering heat from Chris's final flamethrower hit causes car 63 to ignite. The boom die gets its final roll as the spectators take up the "boom, boom, boom" chant once again. The incendiary weapons in Archie's car explode satisfyingly. While Molly has only a dozen of her 95 points of front armor left, she also has the only fully functional vehicle left on the field. 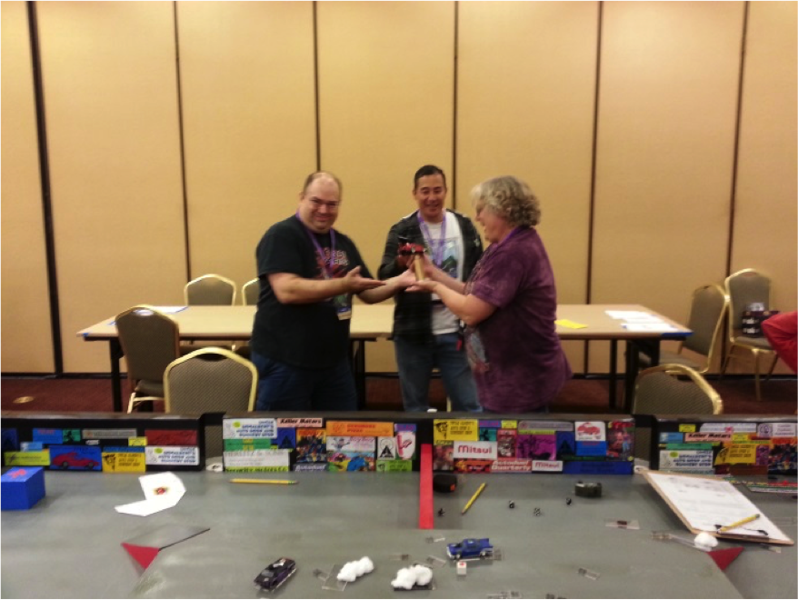 Congratulations to rookie player Molly "Jill" Halvorsen for her victory in the Dragonflight 39 Car Wars tournament! And in an honorable mention, Archie's spectacular triple rocket launcher blast to Tina's driver earned him the "Best Shot" award for the match. For those interested in even more details from the match, please check out Michael Owen's Car Combat Central Twitter feed on August 25th for a Tweet-by-Tweet coverage of the final as it was underway. Also, the Geeks of Cascadia Podcast (available on iTunes and Soundcloud) did interviews with the players before the match about their thoughts, and then one-by-one as they were taken out during the match. They're a blast to listen to. 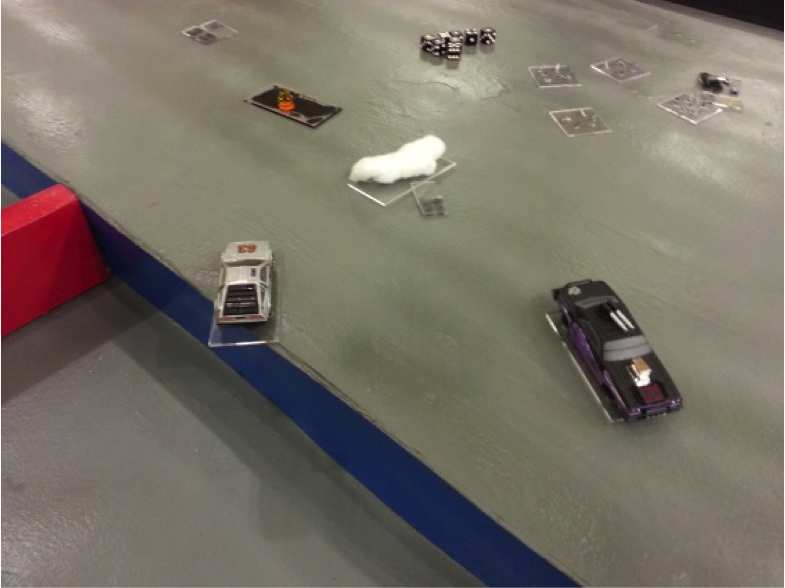 Kudos to Aaron Mulder for his Car Wars Combat Garage, which was used as a source for premade cars, to prepare additional vehicles for players, as well as being used by all three of the players who brought their own designs. 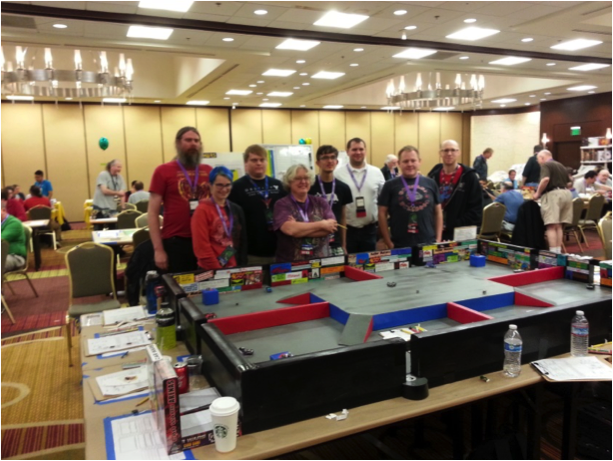 And a big "thank you" to the staff and volunteers at Dragonflight for putting on such a great convention and letting the Car Wars fans take over a large table in the middle of the main ballroom. 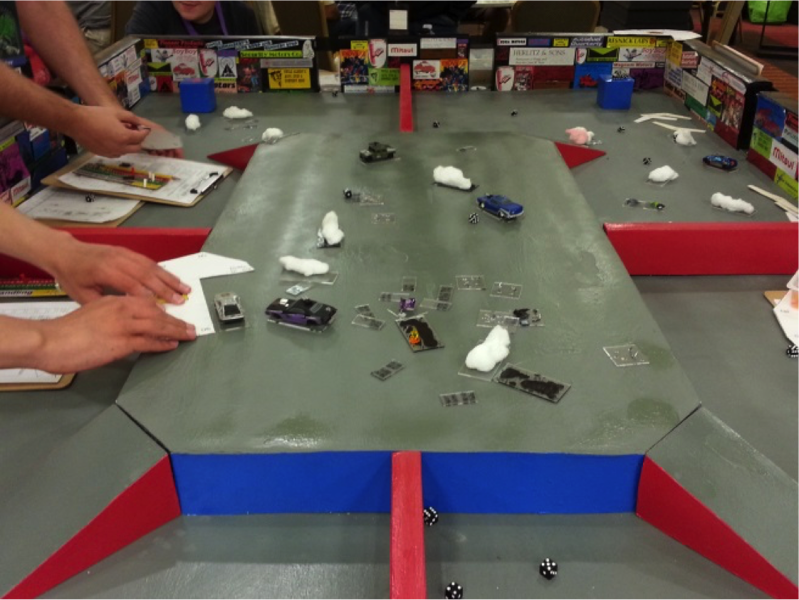 The Pacific Northwest Car Wars saga will continue at OrcaCon 4, January 11-13, and again next year at Dragonflight 40. Until then, watch your handling and Drive Offensively!